It's official. "Sony Pictures has no further release plans for the film," a rep for the studio said Wednesday. The studio has also removed any trace of the movie from it's official website. What was once a joke amongst film lovers has truly become a real life nightmare for Sony Pictures Entertainment and their film The Interview. 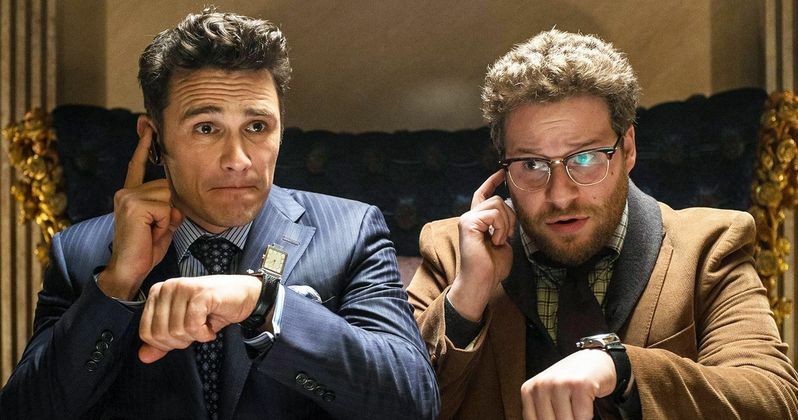 The embattled studio, who was recently the victim of a cyber attack by an organization calling themselves "Guardians of Peace", has decided to effectively shelve their controversial Seth Rogen-James Franco starrer, The Interview. As of right now the movie will not be coming out in theaters, VOD or any other form. That is until it ends up on the internet, right? Could it be that "Guardians of Peace" are simply one or two people sitting in front of computer laughing themselves silly over the mayhem they created? The "Guardians of Peace" apparently have ties or are from North Korea. They have targeted The Interview because it depicts the faux assassination of that countries Supreme Leader, Kim Jong Un. Well, now we know what Sony's response is. It began when Rogen and Franco stopped doing press for the movie. After that, AMC, Regal, Cinemark, Carmike and Southern Theatres all said that they wouldn't show the film. Sony spoke of trying to recoup some of their $42 million dollar investment through pay cable and ON DEMAND outlets. Now, the movie is in limbo; not coming out ANYWHERE. Apparently, the FBI has determined that North Korea is behind the terrorist attacks. There is supposed to be confirmation of this on Thursday. Hollywood is no stranger to controversial films. Martin Scorsese's The Last Temptation of Christ and Kevin Smith's Dogma both found themselves fanning just those very flames when they were released. In those cases, the theaters weren't threatened but the filmmakers. Miramax, back in the gold ole' Harvey and Bob Weinstein days, saw themselves receive a lot of flack from their new buyers Disney when they proposed releasing their controversial film Priest on Good Friday. The film apparently ruffled the feathers of numerous Catholic groups. Still, this was all pre-9/11, pre-internet, pre-24 hour news cycles, etc. Sony and the movie theaters appear to be a tad hasty in their decision. What happens when Hollywood makes a movie that upsets some other world leader? Does it bother anybody that Homeland Security has not found any evidence for an attack on theaters that might've shown the film? Which leads one to wonder if this isn't the work of an "Anonymous"-like hack group? Perhaps they saw The Interview and the news media's fascination with the "if it bleeds it leads" mentality, that it wanted to rock that boat a bit? Might Sony have even been behind this? Might multimillion dollar losses with films like After Earth have forced the studio into the farthest realms of viral marketing? One thing we do know is that the studio isn't going to eat $42 million. The Interview will come out in every format allowable eventually. It may or may not be any bigger because of this controversy. The only thing that really stands out is how one of the largest movie studios in the world was brought to their knees by threats that seemingly may have been spooled off as simply as I wrote this story. Ahhhhh, the power of pressing SUBMIT.